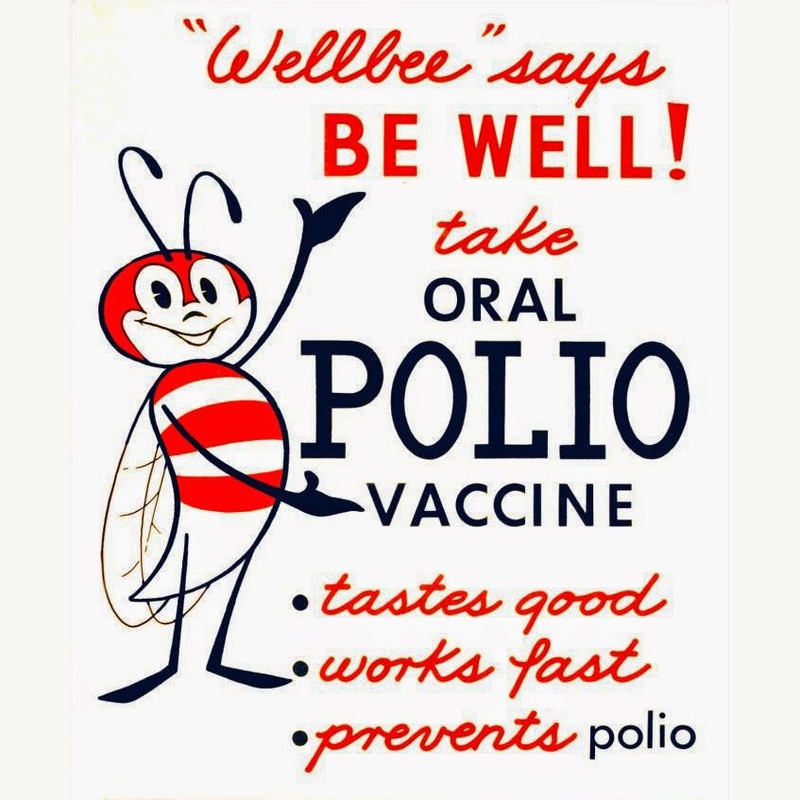 In late summer of 1954 a polio epidemic spread across North America and beyond, a repeat of 1949 and 1950 epidemics that tended to occur in the summer months and dissipate in the cooler weather after harvest season. 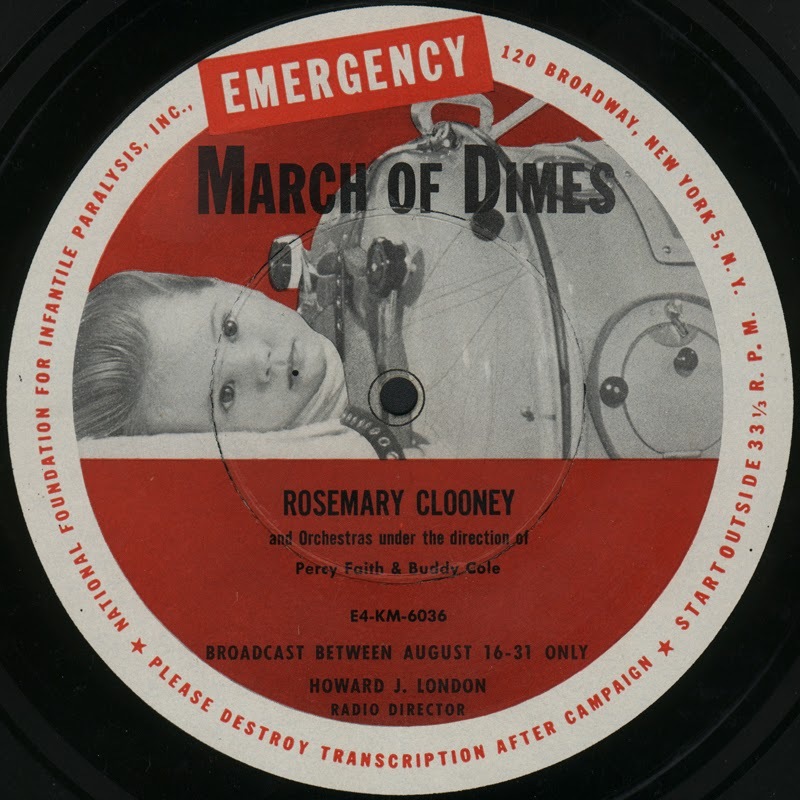 All three epidemics greatly depleted the funds of the National Foundation for Infantile Paralysis, prompting NFIP president Basil O'Connor on each occasion to call an "Emergency March of Dimes", an effort above and beyond its scheduled fundraising drives. There was, however, a crucial difference between the 1954 emergency drive and the two previous; tests were underway of virologist Jonas Salk's vaccine that in the coming years would nearly eradicate the disease. 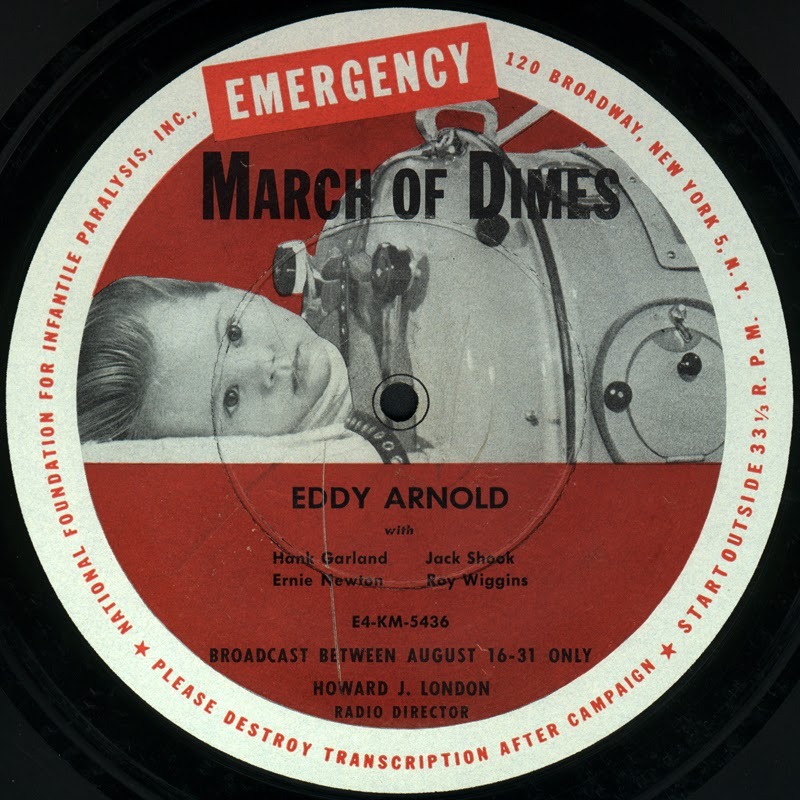 The 1954 Emergency March of Dimes ran from the 16th to the 31st of August, and as in previous campaigns, made use of celebrity endorsements to elicit small donations from a large population of donors (A program from the 1951 campaign featuring Hank Williams can be found here.). The two 15 minute radio programs presented here are from a 16" transcription disc that would have been sent to various radio stations and broadcast as a public service on behalf of the NFIP. The first side features Eddy Arnold in the era's typical live country radio format complete with banter between the star and emcee (here Judd Conlon), cornball comedy and messages on behalf of the sponsor, which in this case are a good deal more serious that those hawking Purina feed or Martha White biscuits. Most likely recorded at WSM studios in Nashville, Eddy sings versions of a few of his then-current recordings backed by a band of Nashville legends consisting of Arnold's signature steel guitarist Roy Wiggins, Jack Shook on chop rhythm guitar (and providing some brief comedy), Ernie Newton on bass, and the great Hank Garland on lead guitar who fortunately is featured on a solo performance of "When You And I Were Young Maggie." The second program presents the music of Rosemary Clooney, and unlike the Arnold side, is not a live program but a selection of her popular recordings linked together by some scripted banter with announcer Fred Robbins. While perhaps not as significant a recording as Arnold's live studio set, it's still a neat piece of vintage radio ephemera and will be of interest to Clooney aficionados. As many who read this are no doubt aware, large 16" transcription discs were the primary method of providing pre-recorded content during radio's "Golden Age". These discs played at 33⅓ rpm but generally had "coarse" grooves like 78 rpm commercial records of the era. Many of these discs were supposed to be destroyed after broadcast and this disc is no exception, "Please Destroy Transcription After Campaign" printed clearly on the bottom band of the label. Thankfully someone either neglected their duty or thought better of breaking this giant slab of a record and we can once again enjoy these performances. When a friend bestowed a small stack of 16" discs on me, I knew this one was special because of the uncirculated Arnold/Garland performances, but I must confess I found the image on the label a bit jarring. I suppose that was the intention at the time when funds were desperately needed to fight a terrible disease that was on the verge of eradication.